MOD-USB3G would also work with your laptop and desktop computer - the drivers are located inside the unit. Note that due to impulse current surges (up to 2A) you might be unable to use MOD-USB3G with other Olimex boards out-of-the-box. You would either need to make hardware adjustements or purchase additional adapter called USB-CAP. For more information refer to the notice in the FAQ section at the bottom of the page. 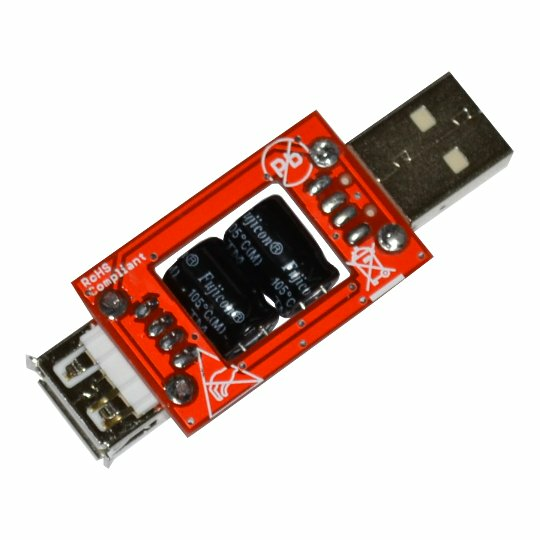 Is MOD-USB3G supported in the official Debian and Android images for your OLinuXino and SOM boards? Yes. The modem has full software support in the official Android and Debian releases. What is the default software procedure to run the modem under your Debian and Android releases? First you have to place a SIM card (without pin code) in the module. Then connect it to USB host connector. Then edit the settings in /etc/wvdial.conf file according to your mobile operator and type: # wvdial 3gconnect There is a lot of information available online on the 3G modem setting up. I can't see any drivers for download. How to connect the MOD-USB3G modem to a PC? 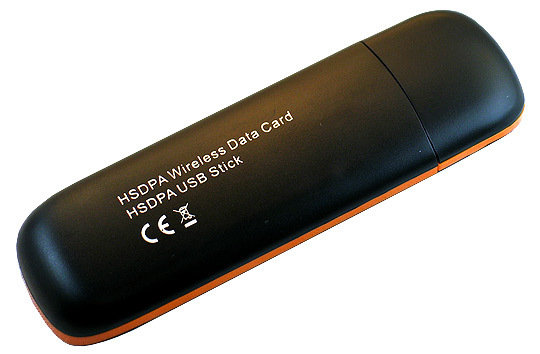 There are Windows drivers and an application inside the MOD-USB3G. When you plug it to your Windows machine the modem would get recognized as a new storage device. 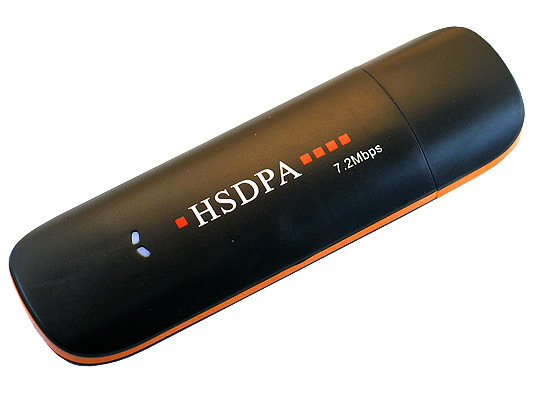 Navigate to this storage device and install the application that you would find inside. It seems that the MOD-USB3G doesn't work very reliably with my OLinuXino board. Since I started using it, my whole setup experiences strange behavior (restarts and power-downs). What might be the problem? 3G modems in general draw a lot of impulse current during certain events. We have measured up to 2A spikes (and the standard 2.x USB provides up to 0.5A; the USB port in most of our OLinuXino and SOM boards provides up to 1A, by default). This makes the usage of all 3G modules unreliable with most embedded systems. However, there are hardware workarounds which might be applied. Adding a capacitor to the USB would lead to a discharge of the impulse currents. The capacitor should be placed between pins 1 and 4 of the USB connector. Usually, such a capacitor might be soldered via additional wires at the bottom of the board (the pins are easier to access at that point). The value of the capacitor should be between 1000uF and 2200uF. It has to be LOW ESR capacitor. 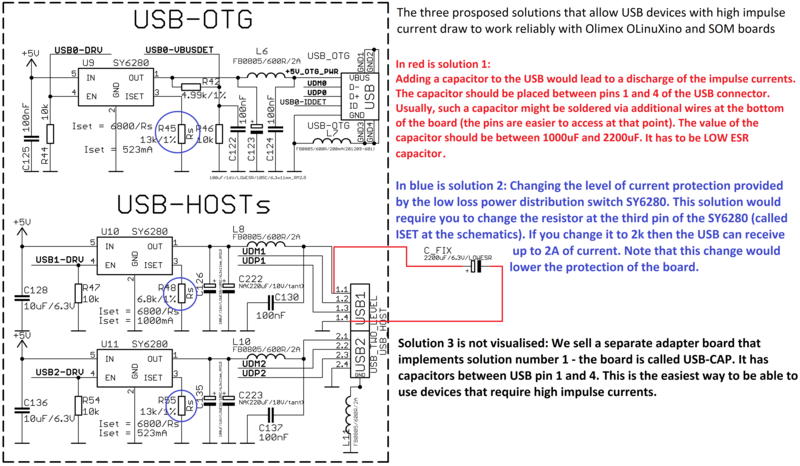 We sell a separate adapter board that implements solution number 1 - the board is called USB-CAP. It has capacitors between USB pin 1 and 4. This is the easiest way to be able to use devices that require high impulse currents. How to send AT commands to the 3G modem? You can send commands via the serial interface named "USB Modem Application Interface (COMX)". The settings for serial communication are the typical: 115200 baud , 8 data bits, 1 stop bit, no parity, XON/XOFF flow control. There is an AT command reference document in the "DOCUMENTS" section. I receive the error "ATDT*99# NO CARRIER --> No Carrier! Trying again"... What is the problem? The mobile network might need up to 90 seconds to initialize and register the 3G modem. Wait 90 seconds and test again. This might occur each time you disconnect the 3G modem (you have to wait 90 seconds again). Some of the modems get recognized as Huawei; others as Qualcomm. I can't seem to get the Qualcomm working properly. What is the reason for that and how to fix it?